london diary: architecture, patterns of power, design and tools of behaviour. today was the first ‘real’ day in london. yesterday was spent recovering from 30 hours travel-time and catching up my with dear friend nina – the schmock. my first port of call was westminster abbey. i know, tourist trap, but i didn’t do a lot of tourist-type things for that exact reason and feel like i missed out on a few key experiences. the abbey was amazing. 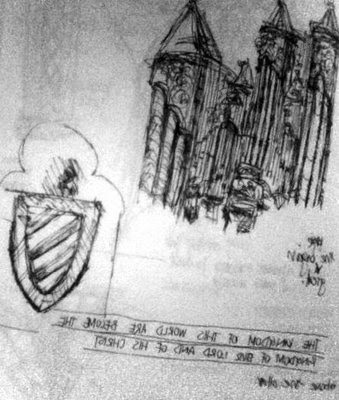 the gothic architecture is so spectacular and i was totally struck by the detail of the heraldry and history. i sketched a few bits and pieces, falling in love with the repetition and pattern of the chapel roof, the transept wall detail, windows and the grand organ. it did get me thinking about the power of pattern in establishing sights of power. in fact i need to do some research on the etymology of ‘order’ – it’s used in architectural terminology a lot and the implications of that, in terms of political and religious control intrigues me. back to the abbey, i was suitably impressed by the place as a working church, monastery and glorified necropolis. there’s some pretty impressive tombs in the place, including both queen elizabeth and queen mary, on top of each other. ha! the cloister garden surround the main cathedral were also divine – so lush and green and restorative. after that i went and had a quick lunch with the dynamic duo will and sam. and when i say dynamic, i mean almost cataclysmic. they’re so polar that you can almost pick up BBC radio with the opposing magnetism.. ha! there wasn’t enough time to get properly caught up, but it was good to spend some time, get some hugs and make plans for later in the the week. after that, i wandered down to the V&A, which was amazing. i hardly got to see any of it last time i was here and even today, i really only checked out the 4th floor – the architecture gallery and the glass section (which exhausted me). i did pop down to check out the silver section, hoping to find a whole section on flatware, to no avail. as i’ve mentioned on this blog before, i have a morbid fascination with flatware and would love to design some one day (which just might be this year sometime). i would love to see a whole exhibition about the history of cutlery and, thanks to the helpful fellow at the V&A, discovered that the Smithsonian had one – the catalogue of which i am now coveting. i think there’s something fascinating about modern tools of habit – glassware, flatware, crockery. all that stuff that shows the trends and fashions of how humans operate in social situations and where that intersects with innovation/design. i’ve also loved slotting back into london life – i’m already charging up the escalators, walking faster on the street, almost getting run over by black cabs and mostly know where i’m going. the weather is not as formidable as i thought it would be. yet. which i’m eternally grateful for and i’m looking forward to catching up with as many people as i possibly can. Previous PostPrevious a space is not so big as when you lose something in it. Next PostNext oh, no ho, so ho, oh.